Combine 3 titles in one order, use code 3DVD on order form, and we'll pay the shipping within the USA! This is the video you will show to your non-PPG friends to show them how fun and beautiful powered paragliding can be! The Salton Sea 2007 convention was fun. Now for a limited time, here's your chance to keep those memories alive if you where there, and see what you missed if you weren't. This beautifully shot 60 minute DVD paints colorful paragliders and personalities onto a majestic desert canvas, the Salton Sea, a landscape that has earned its place in National Geographic. Don't miss this opportunity to add Salty Dogs to your DVD library. Salty Dogs is a documentary film covering the four-day Paratoys 2007 PPG Convention. Held in February at the Salton Sea in Southern California, Paratoys 2007 is on the record books as the largest fly-in to date with over 300 pilots. Salty Dogs is more than "just another fly-in" video, though. Shot in 24 framed per second high definition (just like a real movie or Discovery Channel documentary), this DVD presents the sport of powered paragliding in it's best light, with spectacular cinematography by seventeen year film industry veteran Nate Weaver. Over fifteen hours of material was shot over five days to bring you the best, most entertaining viewing ever brought to the sport. Salty Dogs takes powered paragliding video to a new level; it is sure to become a new DVD classic to the sport. Salty Dogs captures the stunning and rugged beauty of the Salton Sea in over 60 minutes of beautifully photographed flying, personalities and shenanigans. 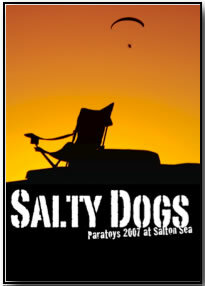 Salty Dogs is an absolute must for the video shelf of any powered paraglider pilot! This film includes some of the first footage of the TrikeBuggy and captured me flying the Swoop (16m) wing in what I call the "SpeedBuggy!" There's even a clip of Bob Armond riding the TrikeBuggy around the landing field! Enjoy!